I love all kinds of soup and I like to enjoy it all year round, but there’s no time when I long for a hot bowl of soup more than when fall comes around. As temperatures get chillier, that good old feeling for comfort food comes back. Always on the lookout for new recipes to try, I was seduced a while ago by a recipe that Stephanie from Wasabimon posted on her blog, a curried potato soup with lamb meatballs. You see, I have a soft spot for meatballs; especially when lamb is involved. And curry reminds me of Indian food, which is one of my favorite international cuisines. This soup decidedly had it all. I printed it and put it in my “to-try” recipe folder and kind of forgot about it. That is, until I went out to take a walk a couple of weeks ago: it was chilly, the very first time I had to layer up, wind a scarf around my neck and even put gloves on before going out. 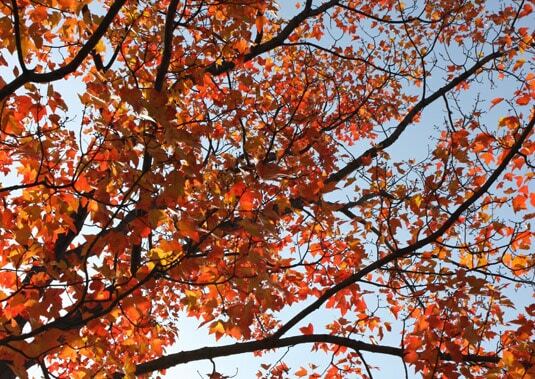 The sun was brightly shining and the tree leaves were adorned in their most beautiful and bright fall colors. I know that admitting this will prove that I always think about food, but the deep red to vivid yellow gradient I saw in the trees reminded me of Wasabimon’s soup. I came back in with only one idea in mind: making that soup and having it for dinner. 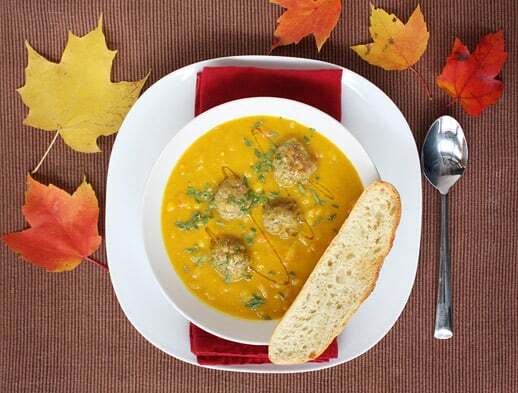 I made a few changes to the recipe, adapting it to use a beautiful buttercup squash, using sweet potatoes instead of red ones and doubling the amount of meatballs – I like my soups hearty and filling. Just add freshly baked bread and a green salad and you’ve got a complete and healthy meal to eat by the fireside. Beautiful buttercup squash equals beautiful squash soup. This soup’s color and mix of classic and ethnic flavors make it perfect for Thanksgiving. You can use any kind of squash: pumpkin, butternut, buttercup or acorn all fit the bill. You could even use zucchini, but I would choose the yellow variety to keep this soup’s beautiful color intact. Be ready for quite a bit of prep time. I like to dice the pepper, carrot, turnip, sweet potatoes and cauliflower very evenly because I puree only two-thirds of the soup to keep a pleasing veggie texture. You could save some time by chopping everything roughly and pureeing the soup completely. This recipe yields many servings. Freeze it in portions and you’ll have ready-made meals for busy weeknights to come. Heat olive oil a large dutch oven over medium heat. Add the leek, bell pepper, carrot and turnip. Cook until the leeks are soft, about 6 minutes, stirring occasionally. In the meantime, grind the cumin and mustard seeds together and mix with the turmeric and curry powder. Add the spices to the vegetables and cook for a minute to wake up the flavors. Add the minced garlic and cook for another minute. Add the diced sweet potatoes and cauliflower, broth, water and salt. Increase the heat to high to bring to a boil, then reduce heat to medium-low. Simmer gently uncovered for 25 minutes. While the soup is simmering, prepare the meatballs: mix the ground lamb with the spices, salt and pepper and roll into 1-inch meatballs. Heat a large skillet over medium heat. Brown meatballs on all sides (about 8-10 minutes total) working in two or more batches if necessary. Remove from heat. Add the corn and the cooked chopped squash to the soup and cook until the corn is tender, about ten minutes. Remove from heat. Reserve one third of the soup in a bowl. Puree the rest of the soup directly in the dutch oven using a hand blender (or blend it in batches in a regular blender). Pour the blended and chunky portions of soup back together in the dutch oven and mix well. Add the meatballs and cook for another 5 to 10 minutes to incorporate flavors. Taste the soup and add more salt and pepper if necessary. Serve or let cool to freeze in portions. Serving Tips: Sprinkle chopped fresh coriander and drizzle a bit of chili oil on each serving. 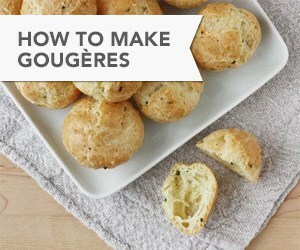 Serve with toasted croutons. Preheat oven to 375°F. Quarter a medium-sized squash (or chop a larger squash in chunks) and deseed. Coat the quarters with olive oil and sprinkle generously with salt and pepper. 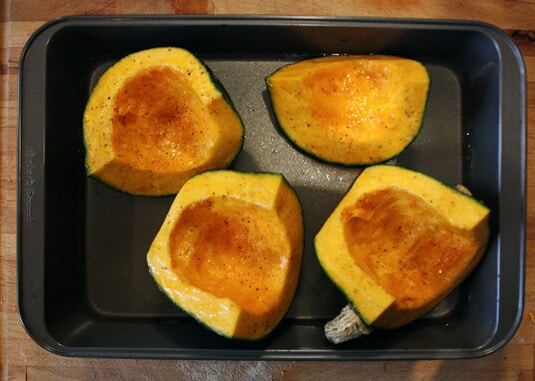 Place in a baking pan and pour ½ inch water in the bottom of the pan (the squash will dip into the water). Roast in oven for 25 to 35 minutes. 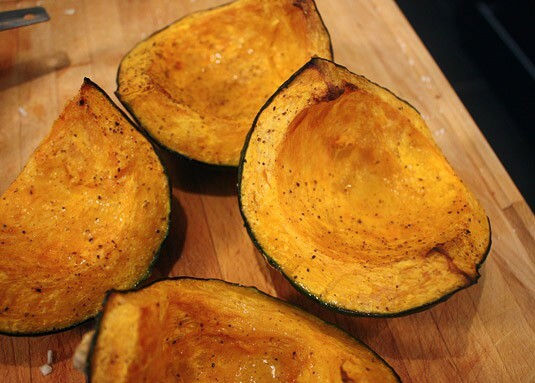 Start testing for doneness after 25 minutes by inserting a sharp knife in the squash flesh. When ready, it’ll be very tender. Remove from oven, let cool on a rack, then scrape off the flesh from the skin using a spoon. Coarsely chop the flesh (if it still hold together) and set aside to mix in your soup when ready. Quartered, oiled, salted and peppered buttercup squash before roasting. Cooked, tender and ready to be spooned out roasted buttercup squash. Cooking the squash whole and removing seeds later is much easier! I cannot wait to make this today for my Mom’s birthday dinner and leftovers for the family this week…..oh boy!!! It looks divine. I’m sure it tastes as good as it looks! Hello Marie! I'm so glad you liked the soup recipe. :) Thank you so much for linking to me! Absolutely divine !!! I wish I had that soup with me tonight !!! It ask for a lot of ingredients but I am sure it all comes together nicely. I would probably just use a yellow onion instead of leek and butternut squash since it's my favorite. But I absolutely have to make it!Perfect for November in MA! I was surprised by the use of a yellow bell pepper and corn in this soup, but they really add to its flavor and texture. I have frozen bags of fresh corn at the peak of the season, I just love to use it in recipes like this one! I think butternut squash would be fantastic, and onion or even French shallots would be great substitutes for the leek. I hope you try it sometime! beautiful soup! love the flavours in this! It's a very satisfying soup! Plus you're rewarded for all your chopping because the soup lasts you a long time when you freeze it in portions. It's a very quick and delicious lunch! Be still my heart…this soup is just beautiful. 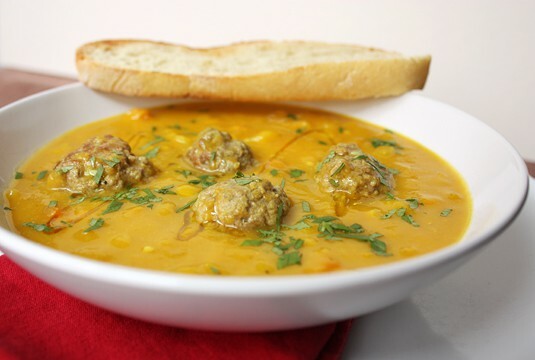 Cream of squash soup is good, lamb meatballs are good…why not combine the two? Exactly what I thought when I saw the original recipe! 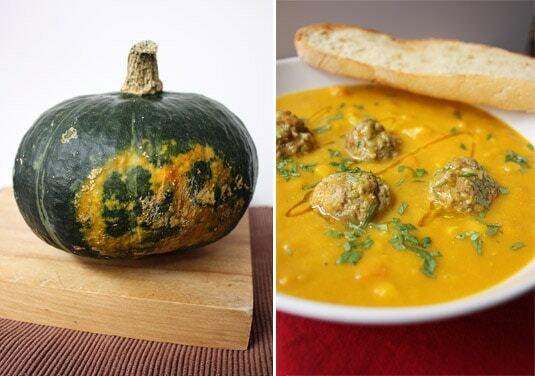 The sweet and slightly peppery flavors of squash and sweet potato combine perfectly together with the lamb meatballs.